12-for-12 from the free throw line? I don't even know who you are any more, Varez. From the start of the new year to the beginning of conference play in January, Auburn basketball supporters have had the joy and agony of watching two completely different teams take the court — the Auburn Tigers At Home, and the Auburn Tigers On The Road. 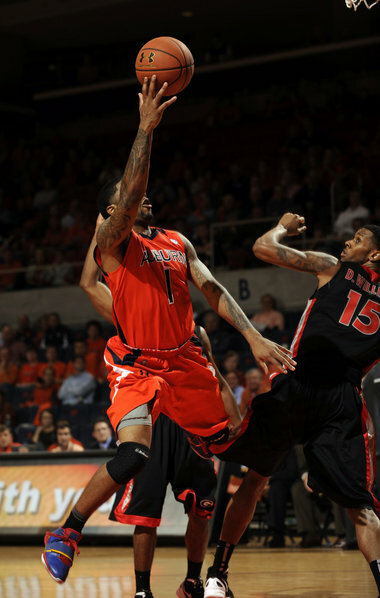 In that span, Auburn is 4-1 in Auburn Arena, with their only home loss coming in a hard-fought contest with now the No. 1-ranked Kentucky Wildcats. Tony Barbee and his club have found ways to win all season at home, where the Tigers are 12-1 on the year, and 14-1 when you count two exhibition games. But just as unexplainable as the magic Auburn seems to find in their own building is how inexplicably lost they appear when they’re not in it. The Tigers are winless, 0-5, since the beginning of Jan. when playing on the road, with some of their worst performances of the season, such as drubbings at Florida State and at Vanderbilt. On the season, Auburn is just 1-8 when playing away from Auburn Arena, that lone win coming against tournament-hosting Hawaii in the Diamond Head Classic over Christmas. That same trend continued this past week when a sound victory over South Carolina at home couldn’t quite propel the Tigers to a win against Arkansas in Fayetteville. And after falling in the waning moments to the Razorbacks, Auburn let the sting of the loss carry over to their next outing against Tennessee in Knoxville, where the Tigers never mustered the second-half run they needed, and fell convincingly. But a different Auburn team took the floor this past Wednesday at home against Georgia, a team playing with confidence and effort, a team playing together—cohesively. It’s a sight that has been pleasantly familiar to the home fans at Auburn Arena. Auburn started the game fighting through one of its familiar scoring droughts, going without a field goal for the first nine minutes of the contest. The Tigers once again looked vulnerable and without more than just one or two dependable, reliable scoring threats. When Frankie Sullivan’s outside shot was off to start the game, Auburn didn’t have much else to lean on until his 3’s finally started to fall with 10:15 to play in the first half. Auburn found a lot of its offense throughout the night on the dribble-drive of point guard Varez Ward. It’s an element of Ward’s game that has been limited all season due to a groin injury; he’s also still trying to bring his knee back to 100 percent. After Ward injurerd his quad at the beginning of the game against Arkansas, Barbee gave him the rest of the week off from practice. The well-rested Ward responded with a 12-point game against Tennessee and 17 points against Georgia. But where Ward did most of his damage, oh so surprisingly, is from the free-throw line, where he was 12-for-12 on the night. Ward went into the game shooting 60.9 percent from the foul line, and has struggled there his entire career, so his clutch shooting from the stripe was definitely a pleasant surprise. His effort from the line, coupled with that of Kenny Gabriel, who went 8-for-9 from the charity stripe (and finished with 16 points and 8 boards), helped the Tigers finish 25-for-31 from the line and on the winning end of the game, despite shooting just 33.3 percent from the field. It was another impressive win at Auburn Arena, where the Tigers have somehow captured some sort of home court magic. That’s not to say that the team turns into a roster of Supermen when it takes the floor at home, but simply that when Auburn is at home, the team plays the way it is supposed to play. All the pieces of the machine seem to function properly. When Auburn is at home, more of Sullivan’s long shots tend to fall, Gabriel has a little more bounce in his leaps, Rob Chubb is a little more decisive in the low post, and Chris Denson’s cuts to the basket are just a little quicker. Auburn plays the way it plans to play when it’s at home, and that’s with suffocating defense, and with an offense that looks to take advantage of every opportunity given when it has the basketball, regardless of how much time is left in the game or on the shot clock. It’s when Auburn goes on the road this season when nearly all of those things seem to fall apart, and, as you might imagine, it’s time for Auburn to go on the road once again as they travel to Starkville to take on No. 19 Mississippi State this afternoon at 3 p.m.
Auburn was able to steal one from the favored Bulldogs at home last season, and contain main threats Renardo Sidney and Dee Bost, but things will be a lot different this time around in Starkville, and with Mississippi State’s addition of former Tony Barbee player and UTEP transfer Arnett Moultrie, who is averaging 16.8 points per game for the Bulldogs. It will be a tough challenge for Auburn, and one of the toughest road tests the Tigers have faced this season. And going into the game, one of Auburn’s first priorities has to be to not do what it did in some of its other tough road tests, like Florida State and Vanderbilt — and that’s absolutely fold right at tip-off. But Mississippi State is anything but invincible, and Auburn has the potential to play up with them and bring the game down to the last few minutes. It’s just going to depend on which Auburn team is going to show up; the one that plays tight and tough and utilizes its strength, or the team that Auburn fans are accustomed to seeing when the Tigers take to the road, that plays without its rhythm, and without its identity. And, regardless of a win or a loss, after Saturday afternoon and its match up with Mississippi State, this Auburn team will be able to return home and focus on the next game on the schedule, in Auburn Arena on Tuesday night: Alabama. Photo via Todd Van Emst. * Human pyramid at Toomer’s Corner!